For the budgeting the whole class worked together as a team to complete the Budgeting side of things but there was a few us that that gathered all the information about items that we were buying which included… GST amount, the item, where to buy it from, the price and the amount of stock that we wanted to buy, and the purpose of buying particular items and how they fitted in with our learning purposes. It took the three or four of us about two or three days to finish the Budgeting side of things. Here are some of the problems that we had to solve when we encountered them. The first problem we encountered was the arguing of who was doing what. Second of all was overspending the first time we calculated the total price we counted that we had a 50 cents left but we had counted wrong as we found later on. Here is the list of what we got. To get all of the products above we tried two different website but one was cheaper than the other website so we got everything of that. What is the purpose for the Creator Ops STEAM Room? You may ask why we decided to make this room, well our class all thought it would be a great idea after a fascinating trip to the Mind Lab. Here is just some reasons why we did decided to make this room. In the process of making the Creator Ops STEAM room would help teach us about measurement and all about the design process and is also a platform for learning about Science, Technology, Engineering, Arts and Maths or STEAM. As we are making this room we are using Empathy, Define, Ideate, Prototype and Feedback, what does Empathy mean? It means that you are able to understand what one another is feeling. What does Define mean? To break down a problem that you are having trouble with. What does Ideate mean? To brain storm and come up with some creative ideas. What does Prototype? It means to make more than one or to make a model of the thing that you are going to make but not the real thing. What does Feedback mean? It means to give positive and negative comments. This Room will also help us to learn about our coding and learn to break down problems and situations that we might come across. Hello everyone we have had a busy start of the term and we have unpacked the furniture and arranged it all we have put together most of the robots and we have if you had seen the room before you wouldn't believe your eyes when you saw it now. These are the 4 items that with be made into light shades. A bucket and the cutlery drainer. We used this Design Thinking Process as a platform when creating the Creator Ops STEAM. We used Ideate to help us to plan and to help us visualize what the room would look like. We used define to find out what the problem is and how we can solve it. The bright colours are to keep us feeling happy and they stand out . 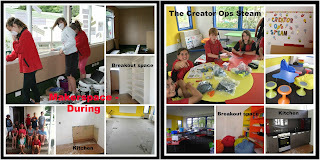 The design thinking proocess we all wanted it to be a learning environment where kids can do work so the design came. We thought we need a lot of tables for kids to sit on to write and draw on. Chairs for them to sit on or go on their knees. We have different sized tables for different needs we had to think about that when our design team where planning and buying things. We have lily pads for on the ground or for our little tables. We have medium seats for our medium tables we also thought about peoples back so they didn't get a sore back from being upright for a part of the day. We found these really cool chairs that are like a stool but with a like circle plastics board underneath and it is able to rock and lean in different directions. Our big stools for our big two tables are again the colours are matching other needs in the room but are not the same.